This is a POC trying to run both a cluster of GlusterFS nodes on top of kubernetes as containers, with the sidecar pattern (also inspired in a MongoDB sidecar article) and able to be mounted on a k8s pod with the kubernetes GlusterFS volume plugin. This sidecar has some limitations on the GlusterFS functionality, it was designed to have just one volume per cluster, have a factor replication of minimum 2, also as per the GlusterFS dependency on important ports as the 111 for udp and tcp mapping, when creating k8s replication controllers and services we need to set hostNetwork to true, so that means we are limited to have a number of GlusterFS nodes no bigger than the number of physical nodes available on the kubernetes cluster. The podtemplate spec works with 2 docker images I created that are not official, the one of the sidecar, and the other of a custom debian glusterfs container. You can change this to your own custom image or use the non-official. This is how long to sleep between work cycles. Depending on your cluster power or your real-time reconfiguration needs, or the amount of logs you want to accumulate, you may want to change this. This is how many seconds the sidecar will sleep its workloop if something is not working as expected and there is some kind of failure. This is the meta.name of the kubernetes endpoints. 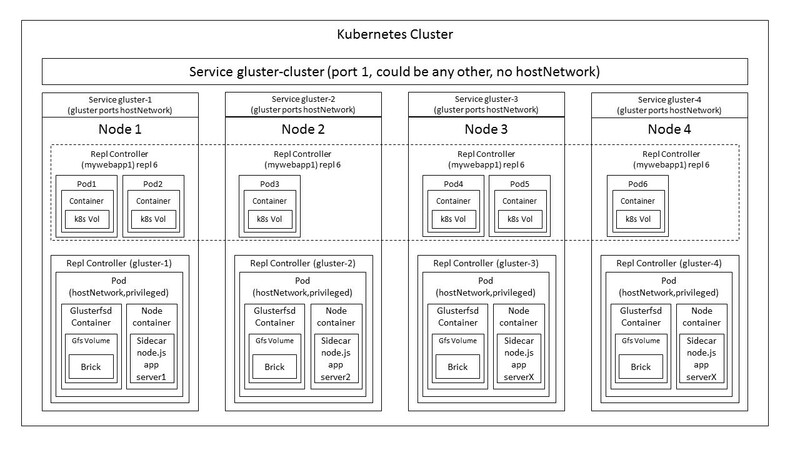 This is the cluster port for kubernetes gluster volume mounting. This is the gluster volume name. This is the gluster brick name. This is the replication factor for files on gluster cluster. Not tested with a number lower than 2. This is the namespace in which this sidecar will run. When no pod exists, the first one (server1) queries kubernetes pods with the corresponding labels and based on that decides that it will be the leader. All the debug logging happens on server1. When a pod exists, it checks to see if is the second pod, if it is the second it will be server2. When server1 finds that there is a new server2, it probes the server2 to create the trusted storage pool. When the trusted storage pool is first created, also a volume is created and also a brick in each of server1 and server2 is created. When more pods are added (serverX’s) each of them finds out there is already a server1 and server2, so they should just wait to be invited by them to the cluster. When server1 finds out a third, fourth, etc. pod exists (serverX) it probes that serverX to invite it to the cluster. Then server1 creates on those serverX’s their corresponding bricks. The number of pods/rc/glusternodes needs to be a multiple of the replication factor. So if server1 finds a serverX but it needs to find 2 serverX for it to reconfigure the cluster to auto-expand, then it will wait until there are enough serverX’s for the expansion to happen. If server1 dies, server2 will now be server1 and the oldest created serverX will be the new server2. If a serverX dies and it was already part of the cluster, then server1 will wait until there is a new serverX waiting to be invited to the cluster, and reconfigure it by copying the data from a server with the replicas of the data that was lost. How to attach this new cluster as a folder in your application for persistent distributed scalable storage. Basically from this step, you now just need to implement what is said in the official Kubernetes GlusterFS volume plugin documentation. In your app’s replication controller’s pod template or in your pod definition, just make sure to have the glusterfs cluster you have just created, mounted as a volume. your app has a folder which is a mount of a gluster, which is available thanks to the gluster plugin and the gluster-cluster service you created, which then routes to the different gluster-N services, and those services finally talk to the gluster daemon of each pod in each rc, which has the volume which has the brick which has your data! This is a POC, is not production ready, we are not sure of the implications in performance neither on security, and I’m open to hear feedback about this approach.